Until 10 years ago persistent hypertension in infants and children was considered an extreme rarity. However, in recent years much evidence has accumulated that primary hypertension in the young age groups is much more prevalent than was previously conceived.42,60,66,67,72,83,113,129,130 Earlier, when an elevated blood pressure was discovered in a child, there was often a tendency by physicians to discount the significance of the finding, relating it to the anxiety of the child. Moreover, there were few facilities available for differential diagnosis and proper treatment applicable to children. If hypertension was secondary to coarctation of the aorta, it could be relieved by resection, and surgery was also successful in the rare cases of renal tumors or neoplasms with endocrine activity. 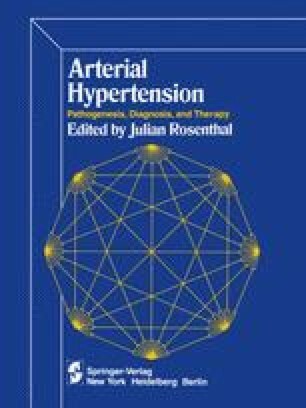 With improved diagnostic methods, nowadays applicable even to infants, such as arteriography, isotope renogram, renal scan, renal biopsy, and renin assay, and with the introduction of new, safe drugs to control hypertension not amenable to surgery, the hitherto nihilistic attitude to diagnosis and treatment has considerably changed.